Story Time at the Senior Center: January Session! Join the children's librarian for a get-up, get-moving story time. 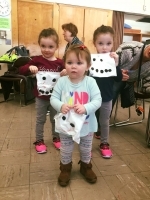 This drop-in program for ages 5 and under features stories, songs, rhymes, and a simple craft. Seniors are also welcome to stop by and take part. Seniors: interested in being a guest reader? Contact Dorrie by phone (781.933.0148), email (dkarlin@minlib.net), or come to a story time to set a date! Programs at the Senior Center are cancelled if Woburn Public Schools are cancelled due to weather.